Increasing consumer preference for using sustainable paper has boosted the growth of the global printing paper market in the recent past, owing to growing environmental concerns worldwide. Surging prominence for digitally printed folding cartons and paper is expected to provide a significant opportunity to the global printing paper market in near future. According to a recently conducted research study, the global market for printing paper will be possibly valued at over US$ 90 Bn by the end of the next decade. The market currently values near US$ 53 Bn and is projected to expand sustainably at a CAGR of 4.9% over 2018-2028. Consumers have been preferring folding cartons since the past few years, which is in turn pushing the demand for paper printed on the digital printers. Demand for digital printers has thus tremendously increased owing to various advantages they offer over the conventional printing technology. With significant growth of the paper industry, printing paper market is expected to witness exponential growth on a global level. Established players have expanded their production capabilities as well as their geographical footprints to consolidate their positions. On the basis of paper type, printing paper market is segmented into coated paper and un-coated paper. By distribution channel, the market has four different segments, viz. hypermarket, retail stores, convenience, and ecommerce. Segments based on application include newspaper, industrial, commercial, books & magazines, and others. By region, Asia Pacific excluding Japan (APEJ) is estimated to capture the largest value share in printing paper market, closely trailed by the Western European market. MEA, although contributes a cramped value share in the global market, it is estimated to thrive notably over the next few years. By paper type, coated paper segment is believed to account for the highest market share of more than 62% by this year end, and is anticipated to register a promising CAGR of 5.3% during the forecast period. On the basis of distribution channel, ecommerce segment is anticipated to register a relatively higher CAGR, whereas convenience segment will reportedly account for the highest market share in terms of value. Among application-based segments, the commercial segment that has been dominating the market will remain the most significant segment with an estimated incremental opportunity of more than US$ 14 Bn over the assessment period. This segment is likely to continue dominance attributed to substantial demand from the advertising sector, in addition to that from magazines and newspapers. The report however highlights that the newspaper segment may exhibit the highest CAGR during the course of market examination. A few of the key players in the global printing paper market include International Paper Company, Georgia-Pacific LLC, DS Smith Packaging Limited, Oji Holdings Corporation, Pratt Industries, Inc, Great Little Box Company Ltd., WestRock Company, Smurfit Kappa Group Plc, KapStone Paper and Packaging Corp, Stora Enso Oyj, Sonoco Products Company, Mondi Group plc, VPK Packaging Group nv, Mayr-Melnhof Karton AG, Clearwater Paper Corporation, Nippon Paper Industries Co., Ltd, Metsa Board Corporation, and Evergreen Packaging Inc.
Transparency Market Research examines the global printing paper market during the forecast period 2017-2025. The primary objective of the report is to identify opportunities in the market and present updates as well as insights about various segments of the global printing paper market. The report begins with an overview of the global printing paper market, evaluating market performance regarding revenue, followed by TMR’s analysis of key trends, drivers and restraints witnessed in the global retail as well as printing paper market. Weighted average pricing analysis of printing paper market is based on paper type, which is also included in the report. To compute the market size, in-depth secondary research is done. Data points such as regional splits and market split by paper type, distribution channel and application have been assimilated to arrive at the market estimates. The report comprises the forecast of the global revenue generated by sales of printing paper market across the retail industry. TMR triangulates the data via a different analysis based on the supply side, demand side, as well as dynamics of printing paper market. TMR not only conducts forecasts in terms of value but also evaluates the market on the basis of essential parameters, such as Year-on-Year (Y-o-Y) growth. This helps providers to recognize the future opportunities as well predictability of the market. In order to understand and assess opportunities in this market, the report is categorically divided into four key sections on the basis of paper type, distribution channel, application and region. The report analyzes the global printing paper market in terms of value (US$ Mn) and volume (Thousand Tonnes). 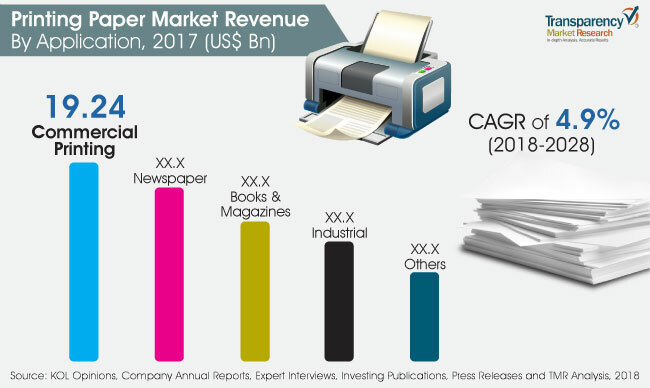 Vital feature of this report is the analysis of the global printing paper market by region, paper type, distribution channel and application and the corresponding revenue forecast in terms of absolute dollar opportunity. This is traditionally overlooked while forecasting the market. However, absolute dollar opportunity is critical in assessing the level of opportunity that a provider can look to achieve as well as to provide potential resources from sales perspective of the global printing paper market. To understand key segments in terms of their growth and performance in the printing paper market, Transparency Market Research has developed a market attractiveness index. The resulting index should help providers identify existing market opportunities in the global printing paper market. In the final section of the report, printing paper market competitive landscape has been included to provide a dashboard view of companies that manufactures and provides printing paper. The report contains company profiles of some of the players in the printing paper market. Few of the key players in the global printing paper market include International Paper Company, Georgia-Pacific LLC, DS Smith Packaging Limited, Oji Holdings Corporation, Pratt Industries, Inc, Great Little Box Company Ltd., WestRock Company, Smurfit Kappa Group Plc, KapStone Paper and Packaging Corp, Stora Enso Oyj, Sonoco Products Company, Mondi Group plc, VPK Packaging Group nv, Mayr-Melnhof Karton AG, Clearwater Paper Corporation, Nippon Paper Industries Co., Ltd, Metsa Board Corporation, Evergreen Packaging Inc.